Low season (April 15- December 15) discounted rates may be available for stays of 14+ nights or stays that completely fill gaps between reservations, please inquire. 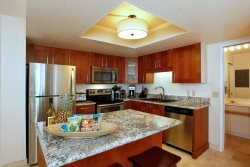 This stylishly remodeled top floor unit (with elevator) has a well-equipped modern kitchen with granite counters, remodeled bathrooms, flat screen TV in living room and bedroom, and double-wide lanai (patio). This unit also has air conditioning in the bedroom (many Maui Banyan units do not have AC in this bedroom) as well as washer and dryer. The unit also has the following amenities: Free high-speed wifi internet throughout, free local and US/Canada long-distance calls (November 2015), luxury high thread count linens, towels and beach towels, Pack-n-Play portacrib/playpen, baby booster chair, boogie boards, tennis rackets, beach chairs, and a cooler. Late checkouts cannot be guaranteed in advance- if you have a late departing flight, we recommend you book an extra night to allow your family to fully enjoy your last day on Maui, then return to the unit to shower and prepare for the trip back home. our units are often booked with back-to-back departure/arrivals, making the possibility of late checkouts after the time of booking rare. CSA Travel Insurance Detailed Description of Coverage.